Documentarian Moore (Roger & Me, TV Nation) is back with an outrageously strong film about violence in America. He begins with an examination of the tragedy at Columbine High School in 1999 and then as he explores issues of gun control and violence, he gets deeper, tapping into the roots of the whole society. The material here is so dense that it's impossible to even outline it here (see the film! ), but basically he tries to understand why America is statistically the world's most violent society by digging into the usual reasons and going layer after layer to the root of the problem. Serious content aside, this is also an exceptionally well-made film, impeccably edited and full of insight and wit. Moore is unafraid to look silly, knowing that we learn when we're laughing. He asks people the most absurd questions, and we're surprised by what they say in response! The result is a film that is absolutely hilarious and deadly serious at the same time, thoroughly entertaining and actually life-changing. There are moments of such overpowering emotion that we can hardly watch, as well as bits featuring pure silliness and farce. And it's not just the USA that's probed here. Moore finds little links everywhere--for example, between nuclear missiles, Columbine and South Park. There's a gentle chronology of US military aggression abroad, a chilling timeline leading steadily to 11 September 2001. (That we see it coming so clearly is terrifying!) There's also an animated history of the film's central thesis: That white America is gripped by centuries of deep-seated fear, mirrored now in the news media (all those "watch out!" stories) and the government's hard-line international policy. 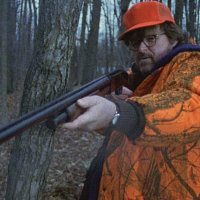 Despite the focus on the NRA and Heston, this is not a pro gun-control film;Moore is just asking the tough questions. And if there's any complaint about the film, it's that he doesn't offer any positive action. What can we do to change this? But then, recognising the real problem is a first step. And as a people we have a long way to go before we even do that. I can't even begin to say how important this film is: Just watch it.